After dealing with Sassy Sue, I found another similar movie to perk my interests. The 2005 sexploitation take-off, Pervert!, should make for an interesting evening, and hopefully, take me closer to my comfort zone! Plot / A young man comes to spend the summer at the remote desert ranch of his father in hopes of repairing their estranged relationship only to find that he's become a psychotic madman. However, who is responsible for the bizarre murders James has uncovered? Hezekiah pins the blame on his son, and after a series of unexplainable incidents, James begins to doubt his own suspicions. Little does he know that the real killer lurks just under his nose! Tonight I ventured way outside of my normal viewing habits when my wife asked me to watch the 1973 exploitation comedy Sassy Sue. While I am a fan of 1970s exploitation, I sometimes wonder what is in store when she picks out a flick. Yee Haw! Plot / Pa, a moon shining chicken farmer, is worried that his dim-witted son Junior is becoming way more attracted to their cow Sassy Sue than he should be, so he sets out to gather up all the nubile young farm girls in the area and get them to show Junior what he's missing. Bess misses you, and she wants to make her presence known. One look into this vintage mirror will give you and your Halloween guests goosebumps as you see her peering back at you! 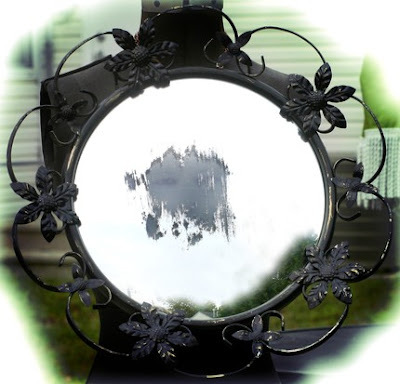 This is an upcycled antique, brass-framed, domed mirror that has been painted black and distressed. The photo is printed on acetate and backed with black paper for that translucent, spooky look. It has a wooden back and chain for hanging. Measures 17" in diameter. Grab this great OOAK item today at the Scarlet Circus! Bad Zombie's 'Gorgeous and Gory' Zombie Pinup Calendar - Get Yours Today! As the countdown to New Jersey's biggest and baddest zombie walk continues (October 30 in Asbury Park), my Friends at the New Jersey Zombie Walk are proud to bring you a Bad Zombie's 'Gorgeous and Gory' 2011 Zombie Pinup Calendar. The bloodiest beauties of the Zombie Walk are crawling out of the Asbury Park debris and onto 12 titillating pages of post-apocalpytic planning in this limited edition calendar! Be the first zombie on your street to have these lovely, lacerated ladies hanging on your wall! Pre-orders will begin shipping the first week of October! Get yours TODAY! After spending a lot of time in the world of vampires, I needed a change. 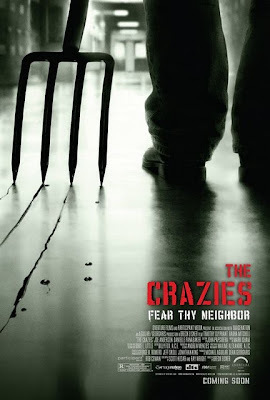 With that in mind, I decided to watch the 2010 redux of the George Romero classic The Crazies. Plot / As a toxin begins to turn the residents of Ogden Marsh, Iowa into violent psychopaths, sheriff David Dutton tries to make sense of the situation while he, his wife, and two other unaffected townspeople band together in a fight for survival. After watching The Lost Boys last night, I decided to stay close to the vampire genre with my next flick. 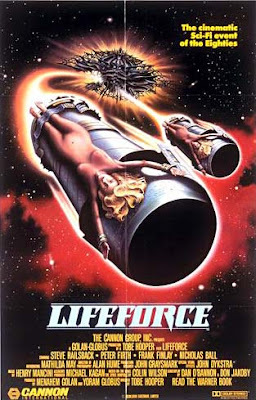 Yes, it is not a true vampire take, but Lifeforce does have some elements that make it close and like the Lost Boys it too was filmed in the 1980s (1985). Plot / A space shuttle mission investigating Halley's Comet brings back a malevolent race of space vampires who transform most of London's population into zombies. The only survivor of the expedition and British authorities attempt to capture a mysterious but beautiful alien woman who appears responsible. After watching Blood For Dracula, I was in the mood to continue the vampire theme. 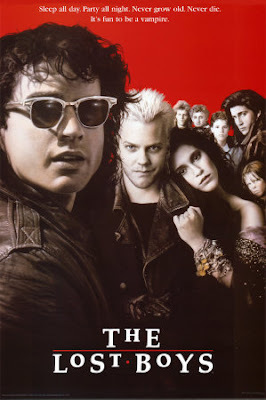 After spending some time recently in Santa Cruz, what a better vampire flick to enjoy tonight than The Lost Boys. This 1987 vampire classic will not only take me back, but is tame enough to let the daughters enjoy it as well. Plot / Financial troubles force a recent divorcee and her teenage sons Mike and Sam to settle down with her father in the California town of Santa Carla. At first, Sam laughs off rumours he hears about vampires who inhabit the small town. But after Mike meets a beautiful girl at the local amusement park, he begins to exhibit the classic signs of vampirism. Fearing for his own safety, Sam recruits two young vampire hunters to save his brother by finding and destroying the head vampire. After watching Flesh For Frankenstein, I decided that it would not be a complete week if I did not follow that up with Blood For Dracula AKA Andy Warhol’s Dracula from 1974. To me, Warhol’s influence on society and the art world is often overlooked and these films are great vehicles of that genius. Plot / Count Dracula know that if he fails to drink a required amount of pure virgin blood, he will not survive. His assistant suggests that the Count and he pick up his coffin and take a road trip to Italy, where families are known to be particularly religious, and therefore should be an excellent place to search for a virgin bride. They do, only to encounter a family with virgins ready for marriage. Unfortunately, the Count discovers one-by-one that the girls are not as pure as they say they are. After spending some time with Jack the Ripper, I decided it was time for a bit of an artistic change. 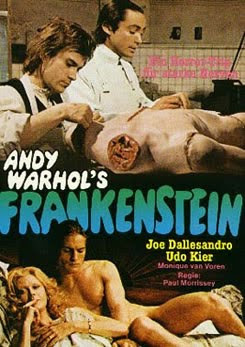 With that in mind, it was a no brainer when I found Flesh For Frankenstein AKA Andy Warhol’s Frankenstein from 1973. Plot / In Serbia, Baron Frankenstein lives with the Baroness and their two children. He dreams of a super-race, returning Serbia to its grand connections to ancient Greece. In his laboratory, assisted by Otto, he builds a desirable female body, but needs a male who will be superbody and superlover. He thinks he has found just the right brain to go with a body he's built, but he's made an error, taking the head of a gay aesthete. Meanwhile, the Baroness has her lusts, and she fastens on Nicholas, a friend of the dead lad. Can the Baron pull off his grand plan? He brings the two zombies together to mate. Meanwhile, Nicholas tries to free his dead friend. Alien Autopsy: Fact or Fiction? And Now the Screaming Starts!